The sign on the roof of Jim Savage's workshop. 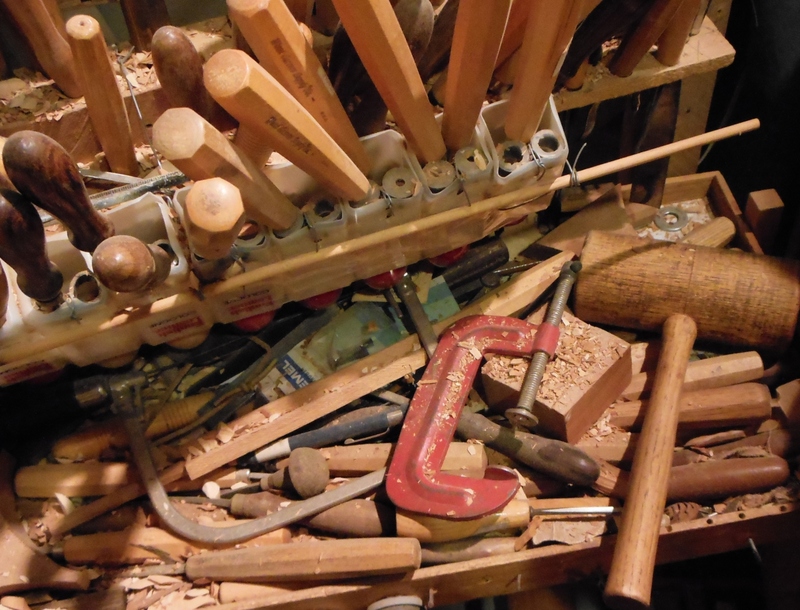 A set of antique woodcarving tools with rosewood handles, kept with others at his desk, were used by Jim Savage throughout his career and were his favorites. In fact, this is the set of tools that inspired him to do his first woodcarving. He purchased the English-made set at a farm auction. At the time he was collecting antique tools. Jim created a special storage system for his tools by taping together empty bottles of English Leather after shave and cologne, cutting the bottoms off, and hanging the units upside down. Each tool has a unique purpose and shape. The larger ones are used for “roughing out” a piece of wood, and the smaller tools are used to complete the intricate details. Jim’s skill, coupled with these excellent tools, enabled him to capture the spirit of the west. 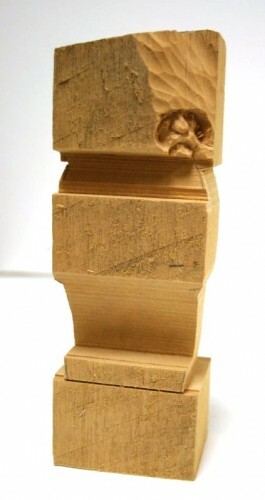 The series below shows Jim using his tools at various stages in the same project. At left, the beginnings of Cowboy Smiling, No Teeth and Chaps. 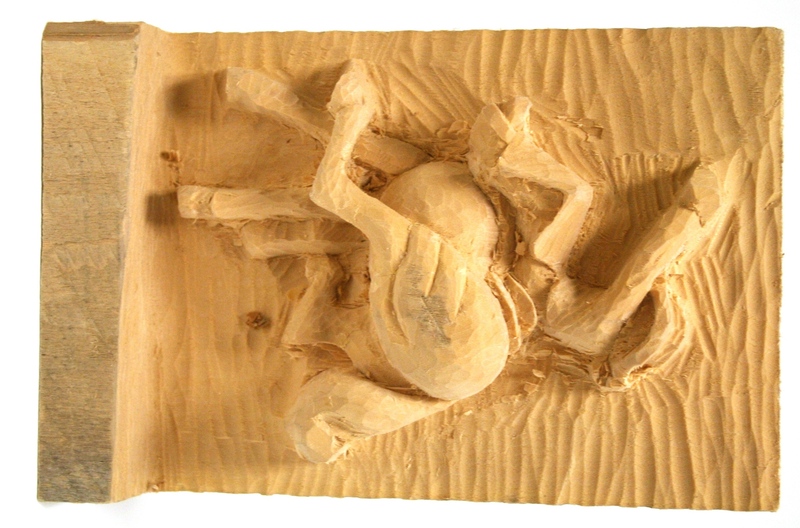 The cowboy's face is just beginning to emerge from the wood. 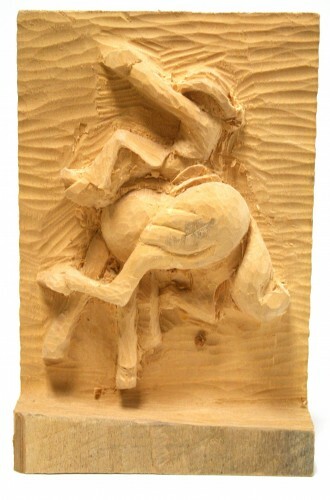 Above, an unfinished cedar carving of Cowboy Riding a Bucking Horse. Jim has already captured the movement and activity of the piece. Jim started this red cedar sculpture of High Bear, an Oglala Sioux, on January 9, 1986, but he passed away a few weeks later. The 1880 photograph of High Bear on the table at left served as the model for the unfinished piece. 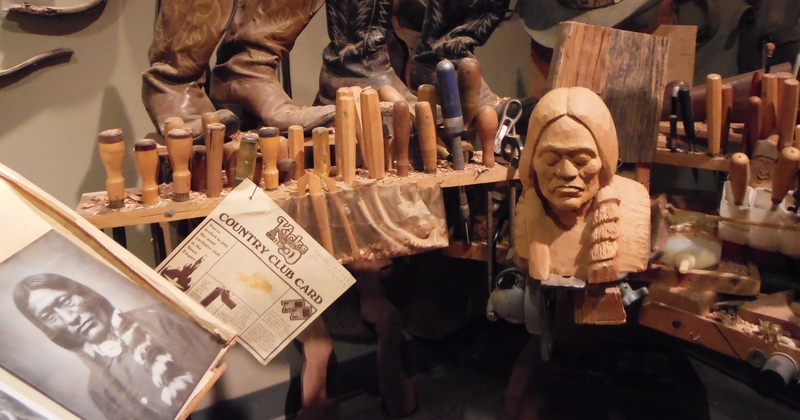 Learn more about the Jim Savage Collection at the Center for Western Studies.